Standard production varies between 21 and 30 days (Calendar days delivered to your door) we have a rush service which is 14 days production and delivery to your door. Extremely lightweight nylon is used to construct the air dancer, and every seam is double reinforced with an additional layer which is bonded and sewn. These air dancers are designed to be lightweight and not require massive amounts of electricity to move around, yet be strong enough to last in the outdoors for a long time. Promotional Air Dancers make awesome advertising at your store front or event. 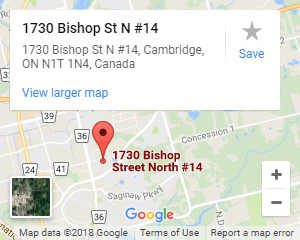 They never stop moving which is a huge advantage in in gaining walk-in traffic to your shop. 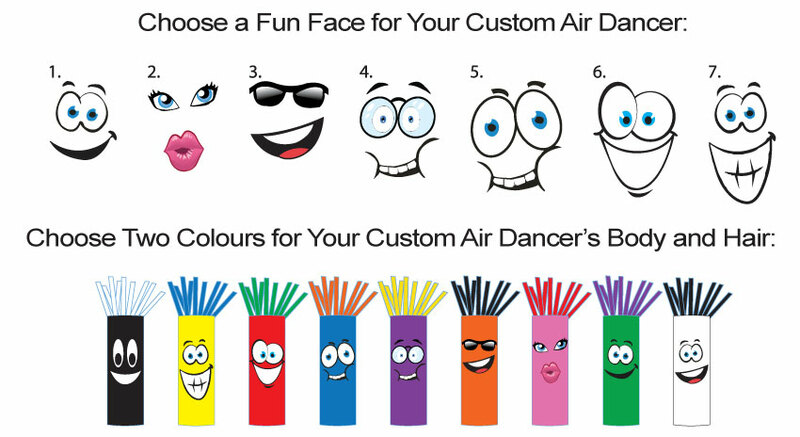 The air dancers can be customized with several different face designs as well as two separate colours for the tube and hair. Design your own today! We specialize in these products, we don't cut corners and we do everything to make the entire ordering process as simple as possible, just reach out to us now and we will begin drafting a print proof of your air dancers. Once you are 100% happy with the design we will produce and deliver the item to you. With so many companies competing for attention in retail industries and also industrial areas there is no better way to draw attention to your shop than with our range of promotional air dancers. They wave and move around which draw attention to passers by, our air dancers are available with a massive branded panel that allows you to put your business name, current promo, sale or even just the classic OPEN wording. Your message can quickly be seen and understood by people driving or walking past and they will enter your store and engage with you. All air dancers ship direct to your door with a blower base which plugs into a standard 3 prong electrical outlet. You the setup process is less than 5 minutes, you simply attach the air dancer using the sewn velcro and press the power button. Up she goes! your promotional wavy dude will be flailing around and drawing attention on your behalf. Commonly referred to as air dancers, sky dancers, or even tube men, these inflatable advertising centrepieces are a must-have item for any keen business owner. Their non-stop motions work well in attracting attention to your shop, sales lot or trade show booth. At Dynamic Gift we provide you the option to customize these items, choosing from a range of colours and designs. The inflatable air dancer offers many advantages to the average business owner. Due to their size and large font printing, they can be seen and read from far away, literally expanding your marketing horizons. Their constant movement and humorous shape simply demands attention of the young and young-at-heart too, drawing in potential customers with ease. Thanks to our customizable printing, you can easily incorporate these promotional items into your overall branding strategy. We do not recommend putting Air Dancers on a rooftop. Air Dancers should be used during the day and brought in at night. Leaving them out overnight and for long periods of time can lower the life of the fabric. Blowers are designed for good weather operation. Leaving out during all weather conditions and extended periods of time can result in damage to the blower. Our warranty covers 8 hours of use per day, 6 days a week. It excludes both rooftop installation and 24 hour a day usage. This is because extreme heat and exposure can affect the lifespan and print integrity of the air dancer.